Click to display or to hide the script from Episode 60. Rosemary Pennington: In 2010, Greece made news the world over as longstanding and growing budget deficits left that country facing a monumental economic crisis. The European Union, of which Greece is a member, agreed to a bailout plan for the country, but with it came severe austerity measures. While with ELSTAT, Georgiou discovered that Greece's budget deficit was actually underestimated, and revised the deficit upward. He, in essence, reported the truth of how deeply Greece was in the red. The plight of Andreas Georgiou is the focus of this episode of Stats and Stories where we explore the statistics behind the stories and the stories behind the statistics. I'm Rosemary Pennington. Stats and Stories is a production of Miami University's Departments of Statistics and Media, Journalism and Film, as well as the American Statistical Association. Joining me in the studio, our regular panelist, John Bailer, Chair of Miami Statistics Department, and Richard Campbell, Chair of Media, Journalism and Film. Our guest today is Greek economist Andreas Georgiou. For the last 7 or so years, he's faced prosecution and persecution over the statistics ELSTAT produced during his tenure there. Georgiou's been hailed into court over and over again, as prosecutors seek to pin Greece's financial pain on Georgiou and his ELSTAT team. He's been found innocent or had convictions annulled until recently. On June 10th, Greece's Supreme Court refused to overturn Georgiou's 2017 conviction on charges of violation of duty. Andreas, thank you so much for being here. Andreas Georgiou : Thank you for having me. Pennington: So. I know there's been a lot that's been going on since you joined and then left ELSTAT. Could you give a broad overview for our listeners who may be unfamiliar with what's been going on with what you've sort of been living with the last several years? Georgiou : First, I should tell you that I took my position in August 2010 and I finished my work five years later in August 2015. Before 2010, the Greek statistical system was producing statistics that for many years were inaccurate, misreported, and manipulated. This is a fact that has been substantiated by the European Statistical Authority, Eurostat, which had been putting reservations on the Greek data for many years before 2010. These statistics in Greece before 2010 were actually at the epicenter of the Greek debt crisis, which has been going on for many years, and it began in 2009. So, the importance of statistics in the problems of Greece before 2010 and the importance of statistics in getting Greece out of the crisis is extremely important and evident here. So, when the crisis broke in the end of 2009, it was imperative for Greece to be able to put its national statistical system to produce accurate statistics and to change the ways of the past. It did this under the pressure of its international and European partners. It extracted the National Statistics Office from the Ministry of Finance where it had been embedded for its history up to that point. It also passed a new statistics law that was supposed to align the Greek statistical production with what was provided for in a European statistical legislation and in the European statistical practice. And this is where my involvement began, where -- when I became aware that the position of the head of the new National Statistics Office was open, I applied through an open gov application process. I got the job and I went to Greece. It was not an easy decision because I left my job at the IMF, but I decided that I wanted to offer something to my country. So, I went to Greece. I found the National Statistics Office that needed to be basically rebuilt in fundamental ways. We applied, myself and my colleagues, there some fundamental pillars of work, if you would like. We tried to apply unswervingly the rules that existed in the European Statistical Legislation, as well as the in the European Statistics Code of Practice. We also tried to apply the rules in the administration of the institution and extracted it from the clientele state in which it existed, as well as to coordinate the entire National Statistical System. We also tried to integrate the National Statistical Office of Greece back into the European Statistical System from which it was considered a pariah, really, because of its performance for many years. We also made a very increased effort to participate and contribute to the international statistical system. This were basically the pillars of the work. Now, as far as the statistics themselves are considered, concerned, one of the first tasks at hand was to undertake the production of the fiscal statistics, the government finance statistics, which had again received reservations from Eurostat, the European Statistical Office, and that were produced in April 2010. We proceeded to do that, and under my supervision, there was a revision of the fiscal deficit for 2009 by 1.8% of GDP upward and by similar amounts in the three previous years. Just to make a note here, twice a year in Europe, in the European Union, these government finance statistics, annual statistics, are being produced for the last four years. It was in that context that we did this revision and it was published in November in 2010. John Bailer: One question I had that comes up. When you describe moving into this position, you said that you were beginning to follow certain specified rules, rules of practice, rules that are part of a larger system, whether it's the European Statistical System for the producing of official statistics... I mean, that feels very abstract. So, for someone who is listening to this, can we take a step back and say, "Alright, an example of a type of rule that we would follow that kind of has been agreed upon by organizations that produce this would be something like this." Georgiou : Yes. Well, there are two types of rules. First, there are the rules that are embedded in sectoral statistical legislation. In this case, it would be a sectoral statistical legislation concerning national accounts, which determine how you produce statistics regarding, let's say, the gross domestic product. Or in this specific case, the government deficit and debt. And a rule, for example... These are very voluminous legislation as you can imagine. They are basically reproductions at the European level of a system of national accounts that exist internationally. There would be rules, for example, of what belongs inside the government, what kind of institutions. And the rules would specify the criteria under which an institution would be included or excluded. Just to give you an even more specific example, for including or excluding an institution, you look at whether it's an institutional unit, whether it is controlled by government, for example, whether the government appoints the directors or the board, etc., and whether there's been economic criteria that's been fulfilled. Let's say you're looking at sales over production costs, if it is above a certain threshold. In this specific case, the threshold is 50%, sales being less than 50% of production costs. In that case, it is included in government. If its sales are more than 50% production costs, it's excluded from government. So, these kind of rules and conventions are embedded in sectoral statistical legislation, in this case, for producing figures for government deficit and debt. Then John, there is also the other rules, what we call principles and ethics, which are embedded in Europe in something called the European Statistics Code of Practice, which is a set of principles, some more detailed than what is in the UN Fundamental Principles of Statistics, and more spelled out with various indicators. For example, first principle is the principle of professional independence, which has a set of indicators. It specifies how official statisticians should operate in order to exercise professional independence, and also how the institutional environment, that is the political and other environment in which the statisticians live and work, how that should operate in order for statistics to be professionally produced independently. Just to give you an idea of a rule that is embedded in there, it is that the decision for the production or dissemination, all decisions regarding production and dissemination of official statistics, alongside the timing and content of statistical releases, are the sole responsibility of the head of the institution. That has to do, of course, also with accountability. So, that's kind of the thing specified in this kind of rule. Pennington: You're listening to Stats and Stories. Today's guest is Andreas	Georgiou, the one-time head of Greece's National Statistical Agency. Andreas, when you came into ELSTAT, and earlier in the conversation, you mentioned the fact that you had to do some revising of some of these numbers and some of the stats the agency had been collecting. What exactly were you revising and why were those revisions so controversial? Georgiou : What we were revising were the government deficit and debt statistics for the year 2009 as well as the years 2006, 7, and 8. This was a requirement under the European legislation. So, we were basically applying European law which is also Greek law, given that Greece is in the European Union. We were revising because Eurostat, which is the statistical office of the European Union, they put reservations on the figures that had been produced there six months before. That's the context. The revision that we carried out was a revision that was in the amount of 1.8% of GDP for the fiscal deficit. This is actually the cause, if you would like, the proximate cause of some of the persecutions that I am facing in Greece. The accusations are that this 1.8% of GDP revision should not have been done, that it was artificially -- that the deficit was artificially inflated and this was done to damage Greece, and caused extraordinary damage to Greece in the amount of €171 billion, which is over $200 billion. There were accusations that this was done by me on instructions from abroad with the intention to put Greece into a crisis situation and under the supervision of its European partners and the international institutions, which of course is not true. We were simply applying the rules that had not been applied up to that point and for many years. Richard Campbell: Andreas, it strikes me as one of the two journalists here, I didn't think of a statistician as having a dangerous job. I think that in terms of journalists often. But here, clearly, this was a dangerous job. Can you talk a little bit about why you think the backlash happened? Georgiou : Let me first comment on why it is a dangerous job, and it is not just a dangerous job in Greece but it can be a dangerous job elsewhere, anywhere in the world. What official statisticians do, is they hold up a mirror to society and, in somewhat a similar way as journalists do, and they, by doing so, they show to society and especially to the people who hold power in society how things are going. If the picture that they are showing through the mirror is not something that is pleasant to those that see it, this can bring the wrath on the statisticians. Campbell: They attack the messenger, right? That happens to journalists. Georgiou : That's right. But this is exactly the job of official statisticians, basically to independently of any kind of influences, with impartiality and objectivity, do this kind of job. That's the fundamental... This is the fundamental basis for our job. If this is not there, then it's not worth doing anything else irrespective of any other technical considerations. Of course, there are other aspects to our job beyond independence, impartiality, and objectivity. There are a lot of other principles that have to be followed because the end result has to be high quality statistics. Bailer: So, Andreas, why should the public care about the independence of a national statistics office? Georgiou : Simply put, because democracy does not work if you do not have official statistics that are reliable, that have been produced independently with impartiality and objectivity. How is the democratic system going to work? How are you going to have accountability of those that rule and those that are elected to rule? If you do not have the information on the performance of the society in whether it's economic or social aspects. And this is what official statistics does. It produces information about economic, social, and environmental development. So, if you do not have... If you have misreported information to the public by official statistics and statisticians on these matters, they cannot hold those in government accountable. The system of checks and balances from the public to the government, as well as within the branches of government, does not hold. How can the legislative branch of government control the executive if the basis on which they're supposed to discuss fiscal developments in the country, whether the government is performing according to the budget law? How is such kind of a control, parliamentary control, congressional control, if you'd like, take place, if the statistics are not reliable? So, the whole democratic system does not work. That's why the public should care. The public should also care because the public wants to make a living. That means that the markets have to work. If the markets actually do not have accurate information about how the economy's going, how various sectors are going, the employment situation, inflation; whatever you may want to look at, all of these are products in official statistics. The markets actually will not work efficiently. And potentially, and Greece is a specific case showing that, they can lurch from crisis to crisis and not be -- of course, not produce optimal outcomes and produce very low welfare, much lower than it could be if statistics were accurate and there was not such uncertainty about the true state of the economy. And of course, technological progress, all of this, requires that researchers and scientists have accurate information. A lot of it is coming from official statistics. So, all of these good things, democracy, economic welfare, social welfare, technological progress, they do depend to a very large extent on official statistics. Pennington: You're listening to Stats and Stories. 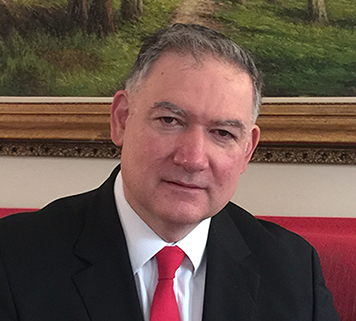 Today, our conversation is with economist Andreas Georgiou. Andreas, what is the situation that you've been dealing with, right? You've been prosecuted multiple times. You've been convicted, had convictions overturned. What is your situation? What is the impact of it been on other researchers, other academics, other statisticians working in Greece? Georgiou : Well, I think that it is evident that if the official statisticians that actually apply the rules, did their work according to the law and the rules, they are dragged through the courts for seven years now; not only me, but also a couple of my senior staff, former senior staff. And this is evident to the official statisticians who continue to do their work in Greece. The incentive structures of these people, obviously, are affected. At the same time, the people who were responsible for the statistics before, during the period of so-called Greek statistics, which unfortunately is a term used for a number of years to indicate misreported and unreliable statistics. The people who were responsible for these statistics before 2010 for many years, nothing has happened to them. So, it is evident what the message and the signal is to the official statisticians on the ground now and in the future: That if you do your job according to the rules, if you apply them strictly and how-the way that-society theoretically expects you to do, you're going to be in trouble and you may end up in jail for life; actually, some of these accusations and charges carry life imprisonment. So, if, on the other hand, you perform the way that it was performed before, producing statistics that got eventually Greece into its biggest depression in its modern history-Greece has lost about 30% of GDP since 2008, nearly 10 years, so, that's a great depression-nothing happens to you if you produce statistics that have been at the epicenter of such a great depression. So, the message is very clear, and it's very dangerous. And the message does not just stay in Greece, the message can go beyond Greece. Because it shows a certain way of handling official statisticians who do their work properly, that they may become an unfortunate model, give ideas to others in the world, when there's political interest and expedience in prosecuting statisticians for actually doing their work properly. This can continue on and on and on, maybe others can also get the same idea. Basically, there are knock on effects anywhere in the world. It also is important to note that since official statisticians can be subject to such persecution that can go on and on, it might mean that the official statisticians are not adequately protected, whether in the European context or the international context. Bailer: So, quick question: What can we, as the public, do to support official statisticians in their work, to make sure that our governments are having accurate and quality information? Georgiou : Well, I think there's a number of things that can be done. This is a multifaceted issue, and it has to be approached by doing a number of things. I think there has to be an insistence from the part of society in general, not just the public, but from all sides including those that are in positions of political power. There has to be appropriate legal framework in place in countries to require the observation of statistical principles and provide an appropriate institutional setup for funding arrangements for the production of statistics. That's essential. Also, as part of the same legal framework, there has to be protection offered to official statisticians so that they are not prosecuted for actually doing their work according to the existing rules. I would say that there has to be appropriate, also, institutional setups so that the national statistical offices and other statistical producers are actually not part of policy structures, and the proper arms-length relationships and independence from the policy side are maintained. There have to be proper funding and staffing and personnel arrangements, personnel policy arrangements for the statistical offices, so just to avoid the exertion of pressures. I would also say that there has to be, if you would like, supranational assessment available in the countries, both for the implementation of statistical principles that we have discussed earlier, as well as the quality of the actual statistics being produced. Coming back to the issue of the press that was mentioned earlier, an independent press is extremely important, as well as a political system with functioning checks and balances. Basically, these are the kind of things, that if you put them all together, you have a good chance of getting official statisticians to produce accurate statistics and protect them in doing so that you have a virtuous cycle in this context [INAUDIBLE]. Bailer: You know, what's really striking to me is how this still has legs, the story still continues. And you've said that they're still using the numbers that you've generated now, correct? Campbell: That's the most amazing thing, that they're persecuting you and they're using your numbers. Georgiou : I apply the rules and they say, "No, you didn't apply the rules" and all that. The thing is that Greece has actually engaged in the biggest bail-out in human history, borrowing something in the range of $350 billion-that's a lot of money-on the basis of these figures and this methodology. So, because the methods that were used to calculate the 2009 deficit for which I'm nominally taken to courts for, it is this methodology... It's very specific things. For example, what I gave you about what is included into the definition of government. It is this kind of a thing, and these specific institutions that were included according to these rules into the concept of general government, they are still being applied today as we are speaking and Greece, even these days, are asking to get $14 billion, the last disbursement under the bailout program, and it is asking for a huge hair cut on its debt that it has incurred these years. So, it borrowed the money on the basis of these figures, now it wants that the debt gets forgiven on the basis of these figures. Because why? Because we do what they call a debt-sustainability analysis, which is basically you look at this stock of debt, and you look at where the debt will go given growth and also the borrowing requirements in the future. Borrowing requirements and debt are in accordance to the methodologies that is being challenged at the highest level by the court. Yet these things, Greece is using them and at the same time they are saying that they're false. Pennington: Thank you so much for being here today, Andreas. Georgiou : It's my pleasure. Thank you for having me. Pennington: That's all the time we have for this episode of Stats and Stories. Stats and Stories is a partnership between Miami University's Departments of Statistics and Media, Journalism and Film, and the American Statistical Association. You can follow us on Twitter or iTunes. If you'd like to share your thoughts on the program, send your email to statsandstories@miamioh.edu and be sure to listen for future editions of Stats and Stories where we discuss the statistics behind the stories, and the stories behind the statistics.